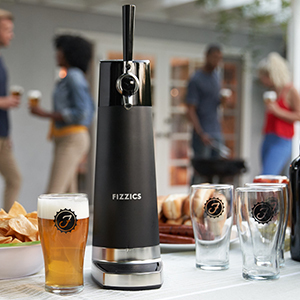 Fizzics Draftpour is one of the Coolest Beer Dispenser that you can buy on Amazon right now. If are someone who needs a helping hand in filling up your glass with beer, this gadget could be a perfect match. 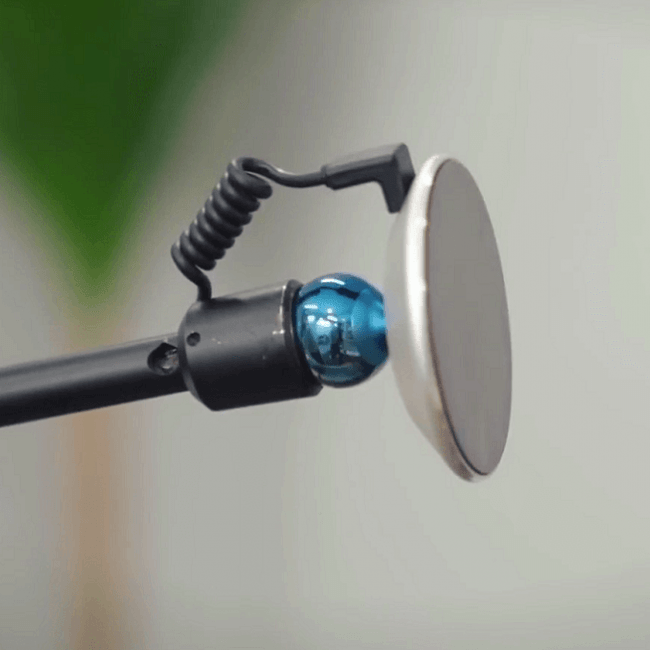 The dispenser is compact and wireless, making it a super portable device that you can carry around. You can either use a USB cable to power up the device or just a couple of AA batteries. 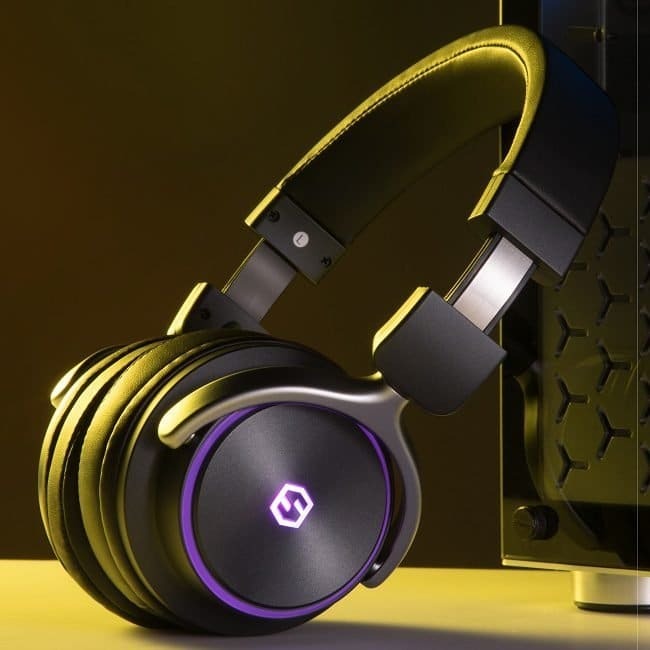 The sleek design makes it looks amazing too. 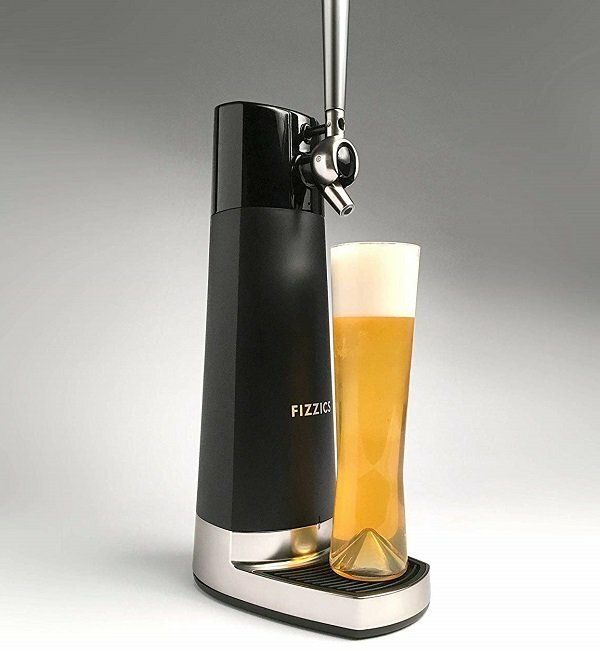 Fizzics beer dispenser is compatible with every type of cans and bottles unless they are too big to fit in. 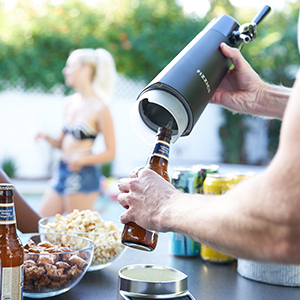 The knob on top of the gadget helps you to control the beer dispensing and also to add micro-foam if needed. Costing around $130, this beer dispenser is definitely not cheap but the reviews say its worth the price. There’s a time and a place for drinking beer straight from the bottle or can. That time is officially up. And that place no longer exists. 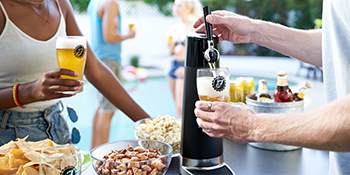 With the Fizzics DraftPour, you can enjoy nitro-style draft beer anywhere. Fizzics converts beer’s natural carbonation into dense, uniformly sized bubbles called Micro-Foam which enhances the aroma, flavor, and mouthfeel of any beer. DraftPour makes every beer taste better. Accommodates all cans and bottles, including 500ml and 750ml bottles. 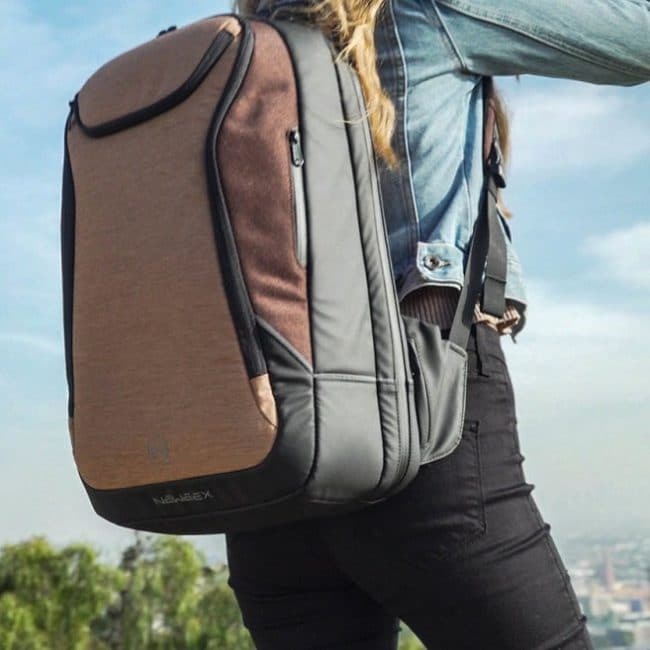 The ultra-lightweight DraftPour weighs less than 4 lbs so it can easily be taken anywhere. What’s wrong with drinking from the can? If beer drinkers can agree on one thing, it’s that beer is best enjoyed straight from the tap. So when you can’t hit the bar, just put your favorite bottle or can into a Fizzics for a creamy, smooth, fresh from the tap taste. Fizzics Micro-Foam technology dramatically improves the flavor, taste and mouth-feel of any carbonated beer. Replicate the taste of a nitro-style beer fresh from the tap in the comfort of your own home. We know what you’re thinking: keep science outta my beer! But in our thirst for great taste, we discovered that something magical happens when beer and sound waves mix: a more dense, long-lasting head that enhances the aroma, texture and taste. That’s no science fiction! With it’s sleek, elegant, the Fizzics DraftPour looks as great in the kitchen as it will on your bar. 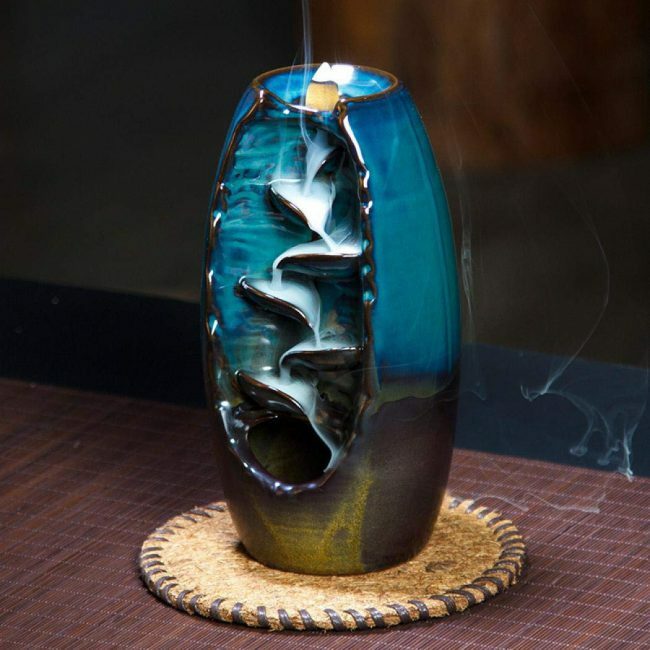 And because it’s built with materials like corrosion-resistant zinc and a durable matte finish, it’s also a cinch to keep clean and will look gorgeous for years to come—pour after beautiful pour. Simply put, the Fizzics DraftPour pours a better beer. IPAs are more citrusy, stouts are more creamy and lagers are more crisp. It’s the product of years of R&D and our relentless drive to deliver a premium beer experience to you. Cheers to that!